After the huge success of our book, The In-Sync Diet, nutritionist Fleur Borelli and I have turned it into an online plan. Going online means we were able to create videos to explain each of the 6 steps of the diet, as well as do videos of the exercises and even one of our guided meditation. And so the The In-Sync Diet 6 Step Plan has now taken the place of the book which is no longer available. 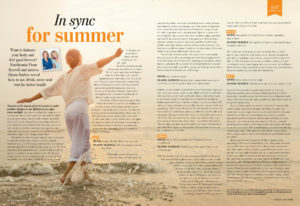 Here, from a recent article in Natural Health magazine, Fleur explains why being In Sync not only restores balance and health, but also helps you to burn more calories and lose fat. Summer is the season when it is easier to make positive changes to our lifestyle as we enjoy more sunlight. And there is nothing like being able to spend more time outside to get back our vitality, radiant skin, physical energy and, generally, reclaim our health. We share our genes with our hunter-gatherer ancestors who lived in a time when they were always exposed to the elements and had to constantly adapt to the change around them. Nowadays, we tend to try and manage our environment instead. We spend hours indoors in thermal neutral environments, where the temperature around us is constant and minimal effort is required to stay warm or cool. We drink constantly from water bottles, in case we should get thirsty, and we eat whether we are hungry or not. We do most things while we are at a computer and, as a consequence, are moving less. And what is more, we try to stay ahead of the game by reducing our sleep time and working on into the night. We try to pre-empt what could happen rather than listening to the natural signals from the body that tell us what to do next. Confusion means hormone dysregulation, disrupted energy levels and a tendency towards chronic low grade inflammation which is at the root of most lifestyle diseases. Among this entanglement the best survival mechanism we have is to gain weight and store fat. It looks at all these factors that are making you feel out of sync. 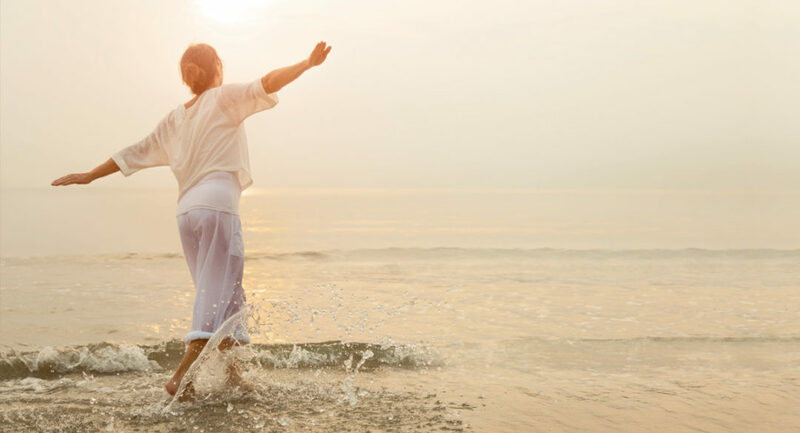 And through our four pillars of health – eat, drink, move and rest – we take you through a process of gradual change that aligns you with your genes so that you become slim, toned, healthier and full of vitality. Within these four pillars we dispel a number of myths that have sprung up and instead look at health from an evolutionary perspective that puts you back in the context to which you belong. IN-SYNC SCIENCE: The less frequently you eat, the better. Genetically, you are designed to move first, eat and then rest and digest, like your hunter-gatherer ancestors. Snacking between meals prevents your digestive system from having a rest. The process of digestion is very costly for your body in terms of chemical energy. It costs the body to produce saliva, stomach acid, digestive enzymes and everything else that is needed for you to be able to digest your food and absorb the nutrients from it. Your pancreas, which produces digestive enzymes, is also the organ that produces the hormone insulin which takes glucose (produced from the breakdown of your food) to your cells for energy. It needs to rest after doing all this work which helps prevent inflammation in your gut. You will also be burning fat in the gaps between your meals. By snacking you will be preventing your body from tapping into fat stores for energy. Instead you will be topping up your glucose stores, known as glycogen. By having five hour breaks between meals and plenty of rest at night, you will be giving your body no excuse but to have to burn fat to provide you with energy. IN-SYNC SCIENCE: Healthy higher calorie foods can often be more beneficial for weight loss than lower calorie foods. Calories are not created equal and it does not make sense to go on a diet where you need to count calories. Different kinds of foods have different effects on the body and health. Higher calorie foods such as protein and good fats may help you to burn fat by keeping you feeling satisfied for longer without needing to eat. Consuming 1,000 calories of fizzy drinks has a totally different effect on your body than consuming 1,000 calories of broccoli. Everything you eat needs to be regulated by your physiology and has an influence on your cells and your genes. Eating a healthy diet with plenty of protein and fat as in The In-Sync Diet will mean that you burn more calories than if you were eating small amounts of junk food – even before you exercise. The healthier your diet, the more calories you burn. Processed food and food full of sugar can also produce inflammation because you are ‘eating against evolution’. MYTH: We must keep sipping water through the day to stay hydrated. IN-SYNC SCIENCE: Drinking water through the day may be making us fat. With the chronic intake of water your natural rhythm is disturbed. Your natural rhythm allows you to detect when you are actually thirsty. Drinking in case you get thirsty upsets the natural signals of your body. Your brain cannot regulate the thickness of the blood with a constant intake of liquid and this will activate one of your stress systems. In fact, drinking little and often has the same effect on the body as if you were under chronic stress. You will be peeing more often rather than hydrating your cells and you will no longer be able to break down that fat around the middle. When cells become dehydrated they can start to store fat. For every litre of water your body loses you can potentially compensate with one kilo of fat. MYTH: You should carb load before a workout, especially a long workout. IN-SYNC SCIENCE: You need to exercise on a completely empty stomach to burn fat. Your body can use both glucose and fat as fuel. But you really have to push your body in different ways to burn fat. Eating little and often, or snacking before exercise, can make fat burning more difficult. This is because chances are you will only burn up stored carbohydrate rather than tapping into your fat stores. You will know this if you have body composition scales because you will break down muscle to provide glucose rather than burning fat. MYTH: Stress makes you lose weight. IN-SYNC SCIENCE: Chronic stress can cause unwanted belly fat. An acute stress response to something the body perceives as dangerous produces stress hormones including cortisol. Cortisol breaks down fat cells to move fat molecules into the bloodstream for energy. The problem is that many people these days seem to exist in a state of constant stress. For your hunter-gatherer ancestors, stress was a response that could be dealt with quickly. Hunger and thirst, heat and cold would have been the signal for us to move and resolve the situation. Nowadays, we have rent or mortgages to pay, bills, school fees and modern problems linked to the fact that everything is on our doorstep – we do not need to hunt anymore. We are constantly producing stress hormones including cortisol. Eventually cells begin to say ‘no’ to the same old hormones banging at their door and stop responding to them. This means that fat cells do not get broken down anymore and we start to store fat instead, particularly around the middle. Becoming a better fat burner is all about changing your physiology to be more metabolically flexible. This means your body can use different energy systems depending on your needs at the time. One minute you may need to sprint down the road to catch a bus, the next you might be taking part in an endurance event. Both of these use different energy systems and you need to be able to flit easily from one activity to another. Metabolic flexibility is vital for you to cope with your daily life and even to escape danger if necessary! It also means you can burn fat easily, which not everyone can do. When you are metabolically flexible you will produce more energy to allow greater capacity for your immune system to protect you. You will also improve psychological flexibility to help prevent neurodegeneration. Becoming a better fat burner means you will be in better health.